If you’re an aspiring leader or a seasoned professional looking to build on your business skills and acumen, WSU’s online MBA programs offers you the distinction that comes from over 50 years of excellence in graduate management education, roots in innovation and excellence, and the proven drive to be at the forefront of both education and business. WSU's MBA program accepts applications from those with a bachelor's degree from a regionally accredited undergraduate institution. All undergraduate fields of study are considered. To be qualified for regular admission, an applicant must have a GPA of 3.0 on a 4.0 scale for the final 60 hours of undergraduate course work, or for 12 or more credits ...WSU's MBA program accepts applications from those with a bachelor's degree from a regionally accredited undergraduate institution. All undergraduate fields of study are considered. To be qualified for regular admission, an applicant must have a GPA of 3.0 on a 4.0 scale for the final 60 hours of undergraduate course work, or for 12 or more credits of recognized graduate-level course work. International applicants also must have a score of 580 or better on the TOEFL. GMAT scores and three letters of recommendation are required of all applicants. In addition to the above requirements, to be qualified for regular admission to the Master of Accounting program, an applicant must have a bachelor's degree in business administration with a concentration in accounting. Students at WSU hail from "extremely diverse backgrounds." However, as most students "lack real working experience," this diversity is generally of the cultural variety: "About half" the students in some years are foreign-born, and "All of the students are friendly and intelligent." Students describe their classmates as "mature individuals"—the average age at entry into the program is 26—"who are attending business school to better themselves for their future careers." They're "open-minded," perhaps to a fault: "They do not have very strong opinions about much in the world," one student reports. Many have part-time jobs on campus, and almost all are "willing to help others" with course work. While a few students believe that "the course load is usually too heavy to take part in extracurricular activities," "Most manage their time very well." Students say that because of the smaller groups in the cohort system, peers in the program "turn into lifelong friends." There are two camps here. The first could be described as the nothing-to-do camp, which claims that life here "is just going to school for classes and returning home [to] study— there's not much entertainment in this city." The other camp says Pullman is a "wonderful college town," and that the campus is "very lively." The campus reportedly has a "perfect gym" that houses "great sports programs." Some students are "involved in organized sports and activities with [the] professors and administration." One student writes, "I am involved in two organizations on campus (MBA Association and Delta Sigma Pi business fraternity). I currently hold two jobs totaling 25 hours a week. I live with other MBA students so that we can do much [of] our homework together." The Washington State MBA program is more than 50 years old and well-respected. The Associate Director works personally with full-time students on professional development, career coaching, resume writing, interviewing and placement. The "proud alumni base" is particularly helpful; many here believe that WSU's greatest strength is the "dedication to each other" shown by fellow Cougars. Some students, however, would like to see more direct "interaction with outside companies." Another student says the program is "so new [that] they do not have the reputation with employers that some other MBA programs have." Washington State's College of Business has gained a strong national reputation for its "fantastic" study environment and "relatively low tuition," but its many attributes are no secret to WSU undergrads. Many students like the school so much that they decide to remain Cougars. "I completed my undergrad at WSU and enjoyed the experience so much that I wanted to complete my graduate degree here as well," one student says. 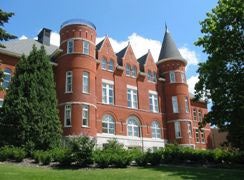 The school offers classes at WSU's main campus in Pullman, and at its satellite campuses in Spokane, Vancouver, Washington, and the Tri-Cities area in the southeastern part of the state. Course work is offered in accounting, finance; insurance and real estate; information systems; management and operations; marketing; and hospitality business management. Master of Accounting, Master of Business Administration (MBA), and Doctor of Philosophy (in business administration) degrees are available. In addition, WSU offers an online MBA. The recently revamped MBA program is "directed toward non-business undergraduate majors" and "accepts students with less than one year [of work] experience." Opinions of the intro-level courses are mixed: One student said his first semester was "a bit weak." Though difficult, it was "really just busywork." By all accounts, things pick up from there, with course work "designed around the issues and direction of the changing business world." There's an "emphasis on teamwork," and assignments are connected to "real-life experience." Professors are "highly experienced." One student says, "The quality of [the] faculty is by far the biggest asset." Professors maintain close contact with students through a "cohort system that allows for smaller classes and greater [student] teacher interaction." This can be a mixed blessing, however. While the faculty includes "some of the best research minds" in the field, some professors "don't know the first thing about teaching," one student says. Fortunately, "The program coordinators listen to and respect student feedback." The school's administrative staff is "on a first-name basis with all the students." They "will go out of their way to help you solve/remedy a problem," though their "speed of handling affairs" could improve. Want more info about Washington State University College of Business Distance MBA? Get free advice from education experts and Noodle community members.